Remember back in June, when John Carmack confirmed that he wasn't going to be at QuakeCon but promised as a consolation prize that his lengthy talk at Southern Methodist University's Lyle School of Engineering would (probably) still be released? More than three months after it took place, the video has finally made its way to YouTube>. Carmack's address at SMU actually took place in April, but the recording he mentioned a few days before the event seemed to just disappear into the void. 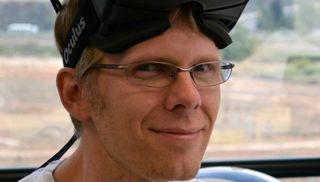 Not even Carmack appeared to know exactly what happened to it; he said on Twitter in May that it "should be coming soon," and then again in June , somewhat less confidently, that it "should still be released." "Soon" flew the coop awhile ago, but after a long delay the video is now online . It's a whole lot of Carmack, running nearly 2.5 hours in total, and even though the audio quality isn't the best, this is actually a "fixed" version of the original release . It's not the same as a QuakeCon keynote, but beggars can't be choosers, as they say. And given the state of relations between Carmack's former employer and his new one, it could be awhile before we see him return to his old stomping grounds.